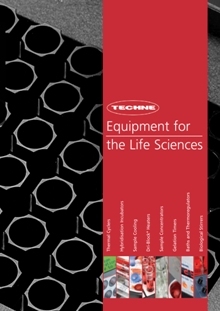 The new Techne catalogue introduces innovative cooling products and the company's extended thermal cycler range. Over 50 full colour pages illustrate Techne's world-leading temperature control and science equipment for the life sciences, research, clinical and general laboratories. Two significant additions in the new catalogue will solve sample-cooling problems in many labs. The N°ICE electronic ice bucket contains ceramic-coated beads to support any shape vessels, and the BL°CKICE cools tubes held in two Dri-Block® inserts. Both maintain a set temperature in the range 0 to 40°C. The Techne family of personal thermal cyclers is joined by the expanded capacity TC-3000X and the TC-3000G, the world's smallest gradient model. Users of standard thermal cyclers will welcome the appearance of the new-look TC-4000 and TC-5000 at highly attractive prices. The Techne range also encompasses temperature controlled water baths, Dri-Block® heaters, cell culture equipment and molecular biology products such as hybridisation incubators.